La Plaza de Mercado La América, named for the neighborhood it calls home, is one of four public markets in Medellín, the second-largest city in Colombia. Most Colombian cities have at least one public market, but Medellín’s markets share something special that sets them apart: they are owned by their vendors. 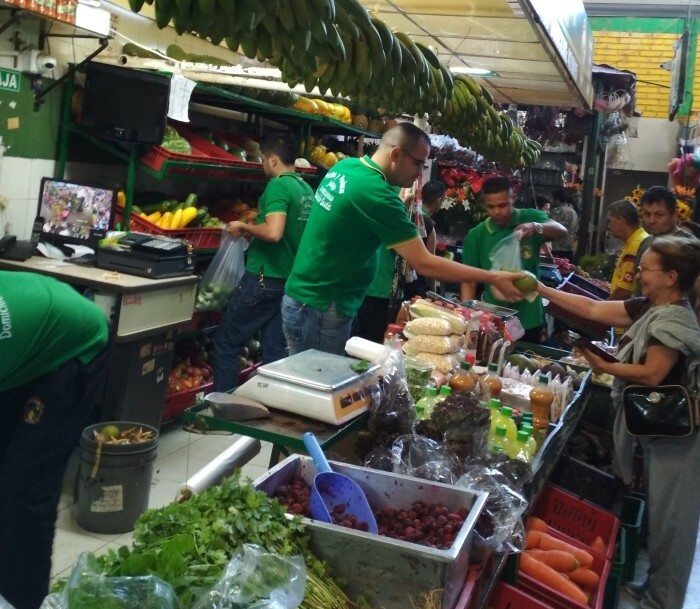 While the the majority of markets in Colombia are managed by the municipality or an outside business, four of Medellín’s largest markets are managed by cooperatives that are owned by the very vendors who work there. Plaza La América’s offices are tucked into a corner of the market’s second floor, and are reached by a narrow metal staircase between a bakery and a greengrocer. I’ve come here to learn more about the history of Medellín’s markets, how they were started, and how they function as cooperatives today. 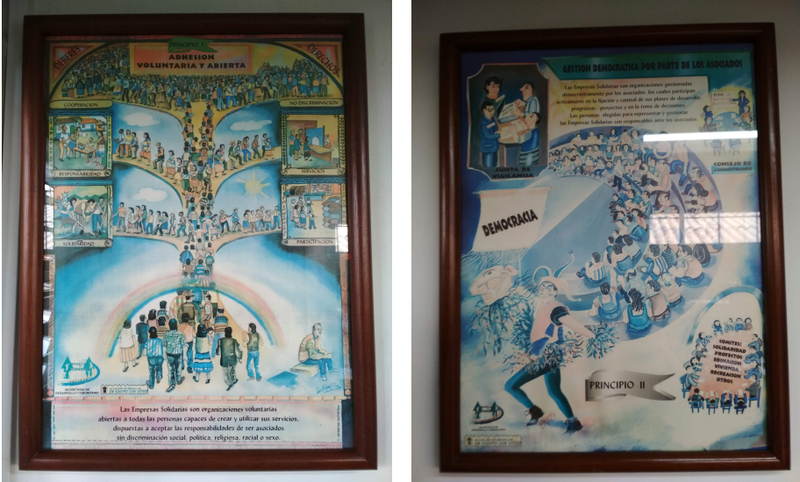 The office is adorned with seven framed posters showing the seven cooperative principles, each a hand-painted picture that was commissioned by the city government in the 1990s. The secretary tells me to wait for Don Cesar, the market manager, so while I wait I study the cooperative posters. Each one is filled with different details and decorations. The style reminds me of the hand-lettered signs that adorned my parents’ small food coop when I was a child. But the members of my coop were mainly worried about finding cheap brown rice, while the artist who made these posters lived in the most dangerous city in the world. Even so, both art styles shared an optimism and faith about cooperation among ordinary people. After a few minutes, I am introduced to Cesar Augusto Simbaqueba, the manager of Plaza La América. His office is dotted with various awards that the plaza has won over the years. As we introduce ourselves, he can tell that I am a little nervous, and reassures me that he is always happy to talk to students. 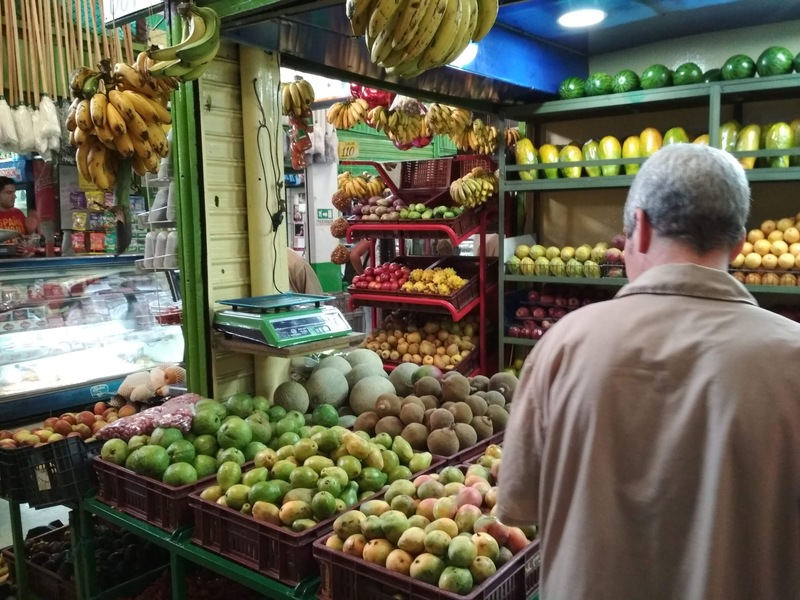 In addition to managing plaza La América, Don Cesar (everyone who works at the market calls each other Don or Doña) runs a federation of the cooperative markets in Medellín, and is a strong advocate for the cooperative model as a way to manage markets. “Ask as many questions as you want. It’s important that young people like you understand what we’re doing here, and how it works,” he says as we sit down. Posters of the seven cooperative principles decorate the market offices. The posters were commissioned by the city and designed by a printing cooperative in the 90s. We start with the history of the markets, which Don Cesar takes all the way back to the Roman forum and the bazaars of southern Spain. This model was translated to Spanish towns in the Americas, where markets were held in the central plaza. Later, towns constructed covered markets that could operate in all types of weather. Until 1968, Medellín’s market was downtown, in a plaza called Cisneros next to the train station. The Plaza Cisneros had the same reputation as most Colombian markets at the time. It was known for being dirty and dangerous, but it was necessary, since most of the food that entered the city was distributed from the plaza’s halls. Then, in 1968, a fire consumed the market’s wooden roof and stalls. Rather than rebuild the central plaza, the city’s officials decided to build five new plazas throughout the city, to try and dispel the downtown plaza’s troubled image. Like many top-down planning efforts, the government’s idea to get the market out of downtown worked better in theory than in practice. 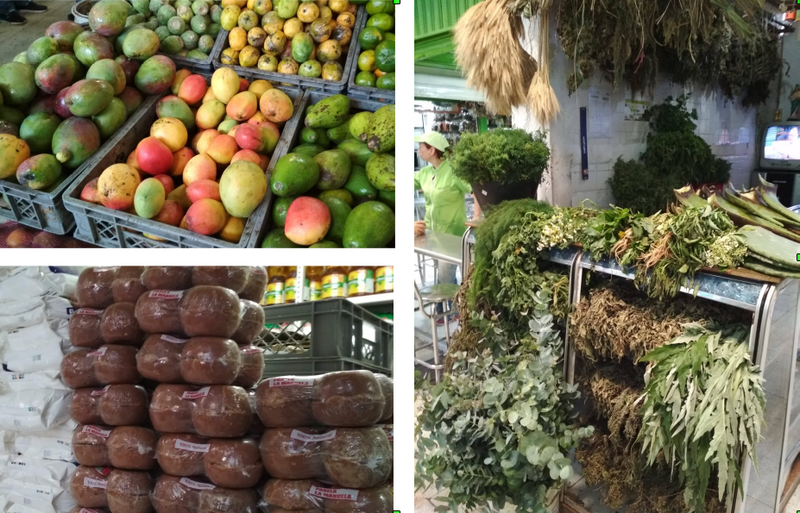 Right after the plazas were built, supermarkets arrived in Medellín, styling themselves as the modern, cleaner, safer alternative to the old-fashioned markets. The supermarkets attracted wealthy residents who were afraid of the gritty reputation of the markets. In addition, the new, far-flung plazas presented problems for vendors that lacked transportation or had long standing credit relationships with downtown customers. As a result, many vendors refused to relocate and chose instead to set up shop in the streets near the old, ruined Plaza Cisneros. After a 15 year struggle, the city gave in and built two new downtown plazas for the vendors who refused to leave downtown, while closing three of the original satellite plazas. Medellín thus entered the 90s with a total of four plazas, all of which struggled to compete with the new supermarkets. Things have certainly turned around for Medellín’s markets, but the revitalization took more than luck. From 1968 to 1995, the markets were managed by the city’s sanitation company, and many problems persisted. According to Don Cesar, this arrangement, which is common in many cities, led to the plazas being neglected and ignored. The plazas were more of a nuisance than a priority for the sanitation company, which after all had a history of seeing small-time vendors as a nuisance rather than as clients. In 1996, the city of Medellin was struggling to rebuild itself after years of influence by the powerful Medellín cartel, which had crumbled in 1993. The death of the cartel presented many opportunities for the city, but the violence was far from over as the national government, gangs, rebels and paramilitary groups all vied for of the city. It is amazing to think that even in such dark times, citizens and elected officials had the political will to debate the finer points of public ownership, but that is exactly what happened when, in 1996, the city council proposed turning Medellín’s markets into cooperatives. It appears that this proposal was the product of a renewed interest in cooperatives and the Solidarity Economy as a form of social improvement as well as a way to end the less-than-healthy relationship between the sanitation company and the vendors. However, the details of the story still remain to be told — I have not been able to find a thorough account of the transition in my research. According to Don Cesar, the sanitation company stayed on for three years in an advisory role in order to facilitate the transition, until the new owners knew the ropes well enough to manage the market themselves. By transferring ownership to the vendors, priorities could be realigned, and the vendors could use their own experience to make the best decisions for the direction of the market. 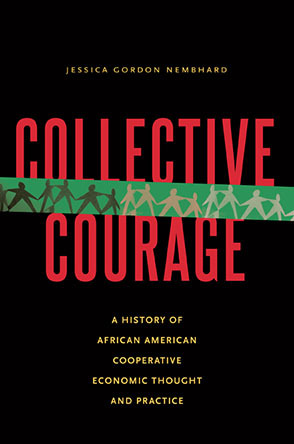 By 1997, the markets had made the transition to cooperatives, and by 2000, they were completely independent. When the coops were set up, the plazas had already been established for nearly 30 years. In order to continue selling at the market, the vendors had to become members of the coop. This created conflict among the vendors. Some of them supported the opportunity for self-governance, others suspected that the city government was trying to foist the responsibility of running the plazas onto the vendors, who were already struggling. According to Cooperative Principle 1, membership in a cooperative should be voluntary and open, but in this case the new coops required membership in order to sell in the plaza. When I asked Don Cesar what this transition was like, he said there were parts that were difficult. “In Colombia, we have something that’s called ‘Resistance to Change,’” he said, smiling, “There was resistance to change because we were going to manage our own company. A lot of people felt like the government was trying to shirk its responsibility by setting up the coops. You know, suddenly being in charge of something is a lot of work, and many people don’t want that.” Education was key to the transition. All of the new members participated 30 hour course on the mechanics and principles of cooperatives, and many vendors picked up new organizational skills like meeting facilitation and record keeping. Colombian law is exacting about the structure of cooperatives and the use of their funds. This is mainly due to a fear of corruption, a problem which has haunted the political realm for centuries. The uses of a cooperative’s surplus earnings (called excedentes in Spanish) are strictly portioned by Colombia’s cooperative statue. 20% go directly into the national government’s general education fund. 20% must be used for education for the members of the cooperative, either in the form of scholarships or education programs within the coop. 20% must go towards member retirement accounts. Like the internal capital accounts of U.S. cooperatives, these accounts grow over time and can be redeemed when the member leaves the cooperative. Members are also required to pay 5% of minimum wage into this fund to boost their retirement savings. 10% must be used for a need-based solidarity fund that members can access in case of accidents or other emergencies. Finally, the use of the remaining 30% of excedentes is decided by the members every year at the annual meeting. Because of these strict laws, Colombia’s cooperative statute effectively mandates that each coop take on a second role as a mutual aid society. This role extends beyond the rules for surplus as well. Rather than letting the money in the retirement accounts just sit there until it is withdrawn, the law permits members to borrow from the coop’s retirement fund at a 1.5% interest rate. As a result, the coop’s members have access to a cheap and local line of credit which they can use to invest in their own businesses. Because it holds both the livelihoods and savings of the members, managing a cooperative like Plaza La América comes with a lot of responsibility. The abuse of this power is also a constant threat. To address the potential for corruption, a Colombian coop is governed by two bodies: the council of administration and the board of vigilance. The council of administration is made up of 5 members, with 5 substitutes elected to make sure that council meetings will always be fully staffed. This council has all the duties of a board of directors, including hiring and firing the general manager, approving the budget, and setting long term goals for the organization. The board of vigilance is made up of 3 members and 3 substitutes, and is tasked with watching the manager and the council of administration. Every year, members meet in a general assembly. There, they hear annual reports from the manager, the council and the board, and elect new board members. The boards are elected by slates. If there is a controversial topic at hand, two slates will usually form, but in general there are not enough people interested in running to form more than one slate per board, so competition is low. When I asked Don Cesar about challenges with governance in the coop, he immediately mentioned member engagement. Like many members of U.S. coops, most members of Plaza La América are too nervous or busy to take on the responsibility of governance. 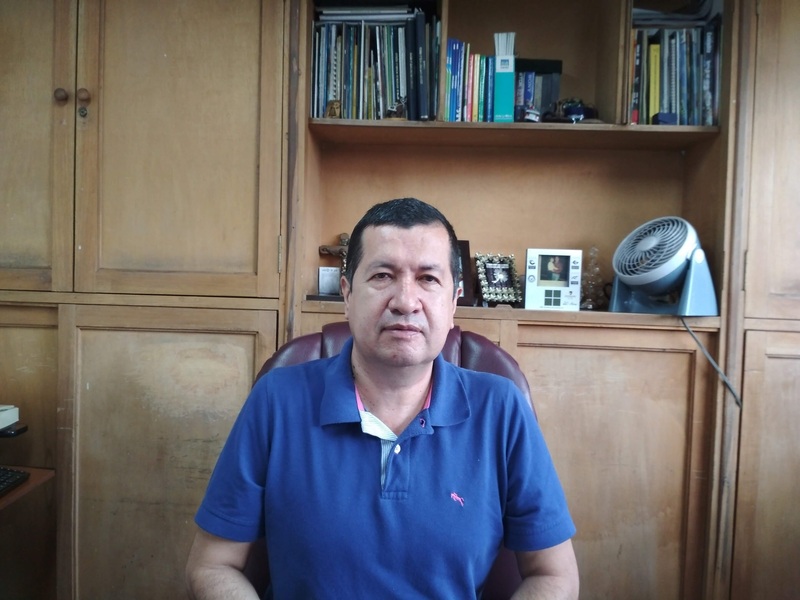 This problem is widespread in cooperatives across Colombia, and many of these coops suffer from stagnation, with an entrenched council of administration that hasn’t seen new faces for 30 years. Luckily, La América’s charter assures regular board turnover---every two years, only two of the five board members can stay, and three must be elected anew from the membership. Even this system, however, doesn’t completely solve the problem. The two boards still tend to be occupied by a core group of about 15 engaged vendors who rotate through the positions year to year. The rest simply choose not to run. Don Cesar has some theories for why engagement tends to be low. First, there is the problem of inertia. The more that a few vendors are seen as “the political ones” as opposed to everyone else, the less people will tend to engage. Second, many members are nervous about the responsibility of a board position. After all, most people would rather not make decisions that might negatively affect their neighbors. This is especially true in a market setting. Whereas in a credit union, two members might only run into each other a few times a year, vendors in a market spend all day together in the same room. The possibility of having to raise fees on someone who is literally your next door neighbor makes members reluctant to take on leadership roles. Doña Irma is active in the cooperative and always attends the general assemblies, but she has little interest in running for the board. “It’s too much like politics, and I don’t have any interest in being a politician” she said. “That’s too much trouble.” In a country where the public opinion of politicians is even lower than in the United States, it’s not surprising that many folks are reluctant to run for elected positions. The cooperative also faces challenges interacting with the city government. These days, every stall of the market is occupied, and its parking lot is crowded with cars and motorcycles. The market is bursting at the seams, and could easily expand, but they will likely have to wait years for the project to be approved. 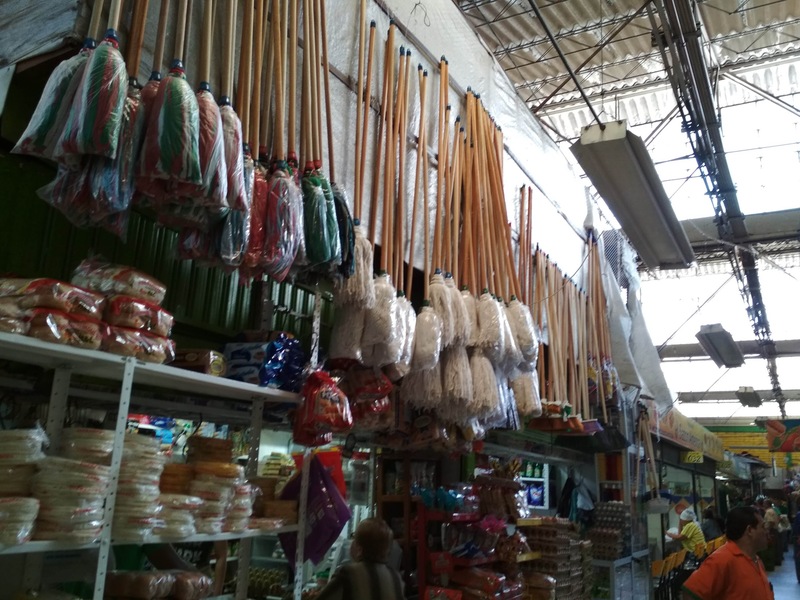 The city still owns the market building which houses Plaza La América’s stalls, and while the owners of the coop can clearly see the benefits of expanding,their status as a cooperative makes it hard for them to acquire the money or the connections to make it happen. However, these challenges have not stopped the cooperative from flowering in the past 20 years. In 1997 the market was struggling, with only 60% of its stalls occupied. Today, every stall houses a shop, and more people visit the market every year. This trend has allowed the coop to think beyond its year to year survival, and take on some ambitious projects in sustainability and community development. In 2000, the coop started a composting program in order to use the organic waste that was generated each day on the market floor. As part of this program, they built an environmental classroom on the second floor. Now, the classroom regularly hosts classes and workshops for students across Medellín, providing a space to learn about the environment and food systems. The project has won several national awards, and activities on the roof have grown far beyond composting to include solar panels, a butterfly garden, rain barrels and a hydroponic demonstration complete with carrots and tilapia.